Even though it is only the beginning of May, we are experiencing summer-like temperatures here in Cincinnati, Ohio. Those warmer temperatures got me thinking about vacation. 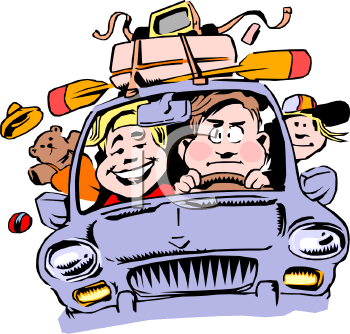 After all, it is about that time of year families start looking forward to getting away and relaxing for a week or two. For most of us, vacation means escaping our familiar home life and experiencing something different–a new location, new adventures, new surroundings. For a short-lived period of time, we leave behind all the responsibilities of home and our jobs and refresh ourselves with some fun and relaxation. I think it is safe to say that the majority only considers it a true vacation if they travel somewhere even if it is only a few hours away. I think it is also safe to assume that the actual travel time spent in the car is least likely to be the highlight of the trip. It is usually what we dread the most. However, if we can keep our minds focused on our final destination and the fun that awaits, we can usually deal with the cramped quarters for few hours. We even manage to pass the time by playing silly games and joining in on the family sing-a-longs. Visioning these road trips got me thinking about our truck drivers here at HG Logistics LLC, a transportation freight broker and third party logistics company in Cincinnati, Ohio. They are on the road every day, fighting through traffic while being confined to a driver seat and traveling day and night, all alone, along miles and miles of state highways. And unlike our vacation trips, they do not always have positive images of their destination spots to sustain them. Usually what await them at the end of their trip are long corridors of warehouse doors and several hours waiting to be unloaded. Even if their destination is a major tourist spot, it is unlikely they will have time to visit any main attractions. Plus, most of these places do not accommodate parking for semi tractor-trailers. If I ask our drivers, they would probably be able to say that they have been to many places, but I doubt they could say they truly “experienced” those places. More than likely, they were just passing through. I know our drivers too long for vacations, but for some reason I find it difficult to believe they would want to take a road trip. Unlike most of us, I imagine some of them may even consider staying home a vacation–somewhere strangely familiar where they could eat a home cooked meal, take a long hot shower, sleep in a comfortable bed, spend time with family, and watch cable T.V. This is only my imagination running wild, but the next time one of our drivers stops in the office, I am going to make it a point to ask him what he considers an ideal vacation. My wish for our drivers is that they can make that dream vacation a reality because our drivers deserve it. I truly respect the job they do because I know it is not easy. It is not something I could do and still keep my sanity. I hope all you drivers out there will be able to enjoy some well deserve vacation time this summer. Whether it is spent lying on your living room couch or on the sunny beaches of Florida–JUST ENJOY IT! And for the rest of us…well, we deserve time off too, so start mapping out your vacation routes now. Be Safe! Have Fun! And don’t let a little family road trip scare you. You will survive. After all, if our truck drivers can do it every day, you can endure it for a few hours.